“How often will you need to visit my dog?” is a question we often receive in an initial enquiry. The answer is – we simply don’t know until we’ve met you and your dog. Each dog is different. Each has their own individual response to their presenting issue – whether it is post-surgery, lameness, arthritis, bonding, and all the other hundreds of conditions we have met over the past 7 years. We don’t subscribe to the “we can fix your dog in three sessions” principle. 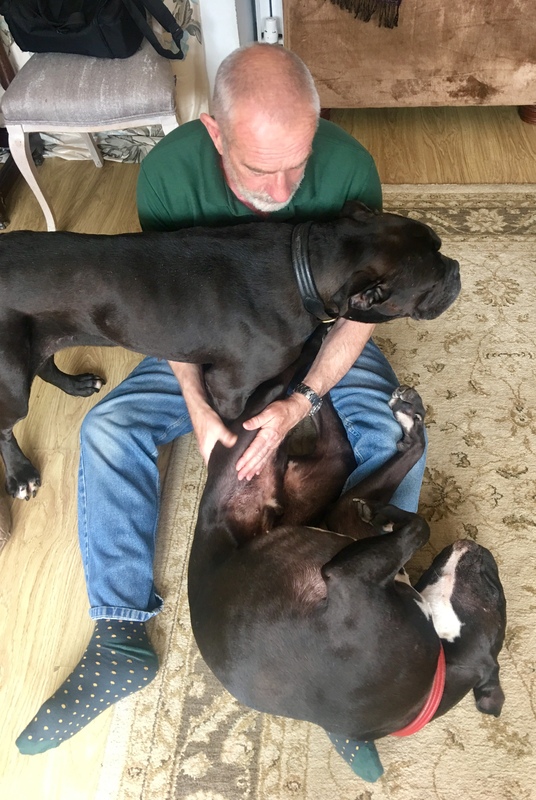 We’ve had dogs who have been helped after just one session, others we see with a series of sessions, some we see monthly, fortnightly, biannually or even weekly. I’ve got a few dogs currently who are in my 100 club – I’ve visited them more than 100 times. Each case or issue is treated as an exclusive case. There is no set schedule for healing. Recently, we’ve had a lot of returnees all for different reasons. 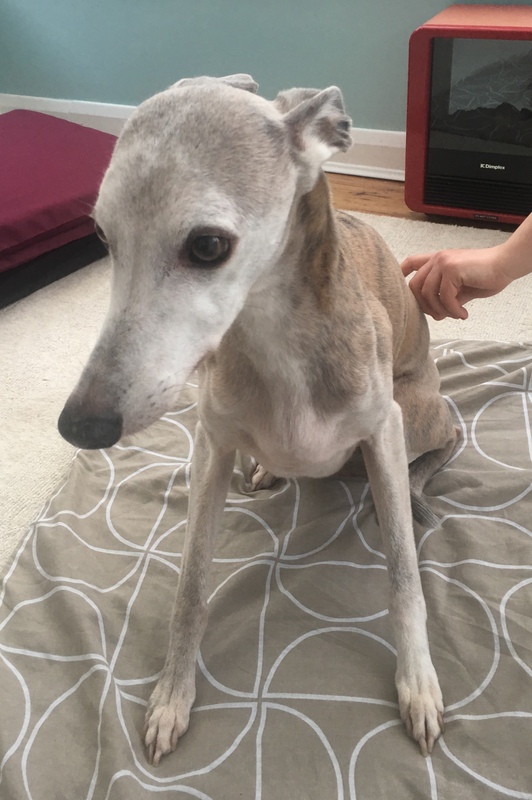 One such returnee was Whippet Sonny who has been visiting us since April 2016 and comes back every 3 to 4 months or so for a maintenance session to sort out his niggles and issues which mainly focus around his iliopsoas muscle and sometimes his shoulder. His Mum does lots of homework in between sessions and has added some exercises to help him stretch his back legs. He is now seeing a chiropractor as well – adding to his impressive multi-modal therapy regime. When he came back the other week he did his usual “OK…I love this but I’m not sure” thing – his Anxiety Alarm goes off and he walks away. But he then comes back when the alarm has finished. This goes on usually for 20 minutes when he decides to turn the alarm off completely and just fold himself into my legs. Which is exactly what he does – he moulds himself to my shape. And that moment is magic for a therapist. Total trust. Pure magic. Pure Sonny. Another is Auntie Pearl & Ralph, 8 year old Sussex Bulldogs. We’ve been visiting them since 2014. Originally Auntie Pearl had a very stiff neck – such that she couldn’t turn her head to see behind her but had to rotate her whole body. Massage, exercises, carer education and empowerment helped to sort that. Ralph had a break in his leg when he was only 6 months old and needed some balancing. Their frequency of visits is ‘as needed’. It can be 1, 3 month or 6 months between visits. Recently I was invited back after Auntie Pearl was knocked over by a car who simply carried on driving. She is also undergoing acupuncture, laser and homeopathy. Ralph wanted his maintenance session to help ease him out and keep him in shape. Ezri has also returned a couple of times recently. 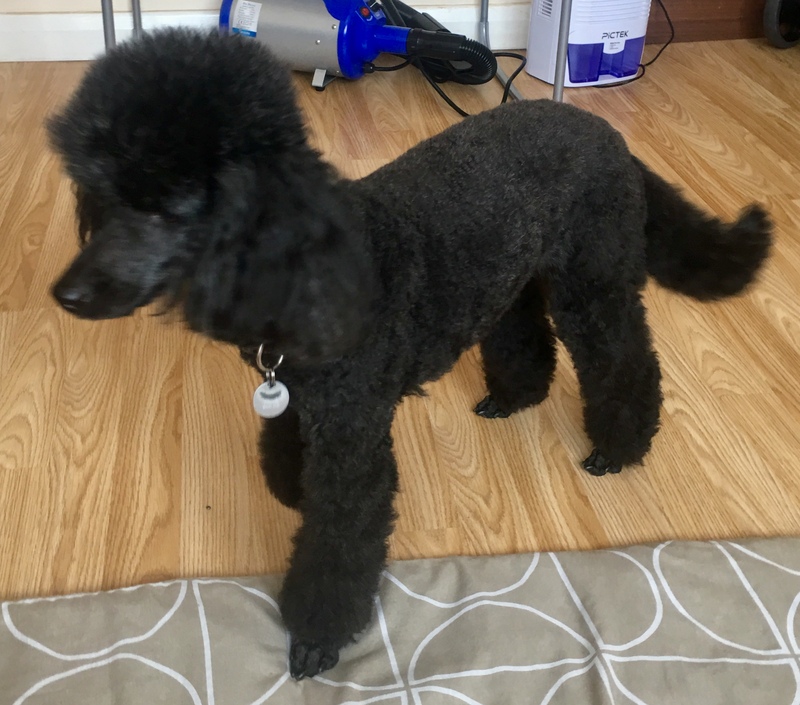 She is a 9 year old Miniature Poodle agility dog who has just been accepted into the ParAgility International championship in Manchester in the autumn this year with her Mum (http://imca-pawc2018.co.uk/ ). I was invited over to help her last October when something was ‘not right’ and her mobility was niggling her. At that time, we found that giving her shedloads of myofascial release massage was exactly what she needed. Her coat started to fit better. Her fur started to move again. Her muscles were free to flex and extend again. Her niggles were on the way to stopping. We also added our AchyPaw warm-up/cool-down to her agility routine. Her Mum has been doing all her homework and now Ezri is about to start competition season again and we were invited over to get her primed and ready. If we can’t come up with an exact ‘quote’ of how long it will take, bear with us…your dog is an individual and we aim to treat them as such. This entry was posted in acheypaw, achy paws, AchyPaw, achypaw myotherapy, agility, agility dogs, arthritis management, Brighton Dog Massage, canine arthritis, canine arthritis management, canine myotherapy, canine myotherapy, dog myotherapy, achypaw myotherapy, myotherapy, achy paws, conditioning, Dog, Dog massage, dog myotherapy, empowerment, massage benefits, multimodal, multimodal therapy for dogs, myofascial release, not just arthritis, prevention, senior dogs, south coast dog massage, south coast myotherapy, Sussex, Therapeutic, therapeutic massage, warm up and cool down and tagged acheypaw, achypaw, achypaw myotherapy, achypaws, Canine massage, canine myotherapy, Dog massage, dog myotherapy, east sussex, injury prevention, massage, south coast dog massage, south coast myotherapy, therapeutic massage, www.achypaws.com. Bookmark the permalink.